Whether you live on a windswept shore or a sunny suburban street, the versatile Hamilton™ hot tub spa will make you feel right at home. Big enough to welcome family and friends, it’s also ideal for a solo spa hydrotherapy session. The therapy lounge and the Accu-Ssage™ spa therapy seat each provide a deeply relaxing massage, while side-by-side seating lets the two of you enjoy soothing neck massages delivered by SMT™ Micro Adjustable jets. When night falls, the bubbling water glows with SunRay™ LED lighting inside the spa – hot tub ambience which includes light rings around the hot tub spa air control. The multicolor lights can even be “frozen” on one shade to achieve the effects of chromatherapy, the healing energy of color and light. 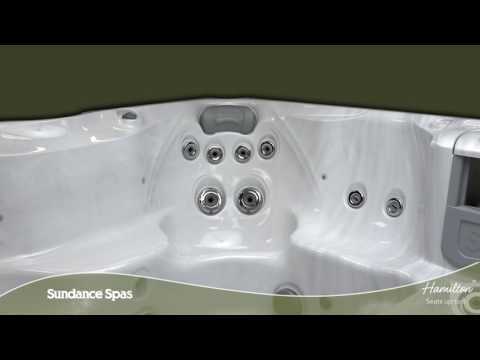 For sheer fun, unparalleled hot tub hydrotherapy, and a luxury look, explore a Sundance® Hamilton hot tub.